Actress Lori Loughlin was a proud mom sending her oldest child off to college when she appeared on TODAY in 2017 alongside her daughter. "I think I'm in complete denial,'' she told Kathie Lee Gifford and Hoda Kotb about her daughter Isabella, who was leaving for her freshman year of college that fall. "When I think about it too much, it will make me cry." The FBI is now alleging that the "Fuller House" star and her husband, fashion designer Mossimo Giannulli, were part of a bribery scheme to get Isabella and their younger daughter, Olivia Jade, into USC. Isabella, who is currently a student at USC, said on TODAY in 2017 that she was looking to act in movies or TV. "I just love all of it,'' she said. "I'd be happy to do anything." She added that her mother had "helped me with so many auditions also, which is so nice." Olivia came under fire last year for saying she had no real interest in college and was more interested in going for the "game days and "parties." 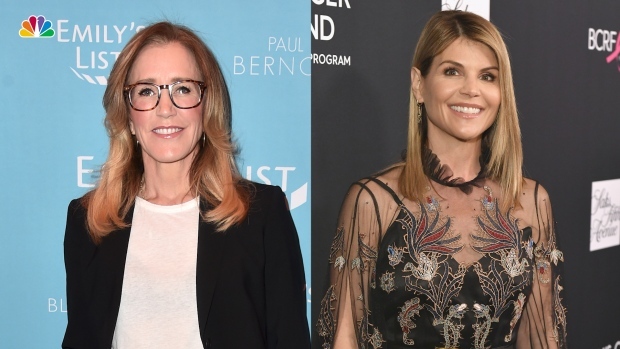 Court documents unsealed on Tuesday reveal that Loughlin is among 50 people, including fellow actress Felicity Huffman, who have been charged for allegedly taking part in a $25 million college entrance exam cheating scheme to get their children into top universities. It's the largest college admissions prosecution by the Justice Department in history. And in a case of art imitating life, fans of the show were quick to point out Loughlin's "Full House" character Aunt Becky faced a similar dilemma on the show...but chose the right path instead of embracing the dark side. According to NBC News, In the episode, "Be True to Your Preschool," Loughlin's character and her husband, Jesse Katsopolis, played by John Stamos, are forced to make a tough decision between wanting the best for their children and potentially committing a crime. After realizing their twin boys won't be admitted into a prestigious San Francisco preschool, Jesse decided to take matters into his own hands by taking the "fast track" and fabricating information on the application form. "The most important thing in the world right now is their education," Jesse says in the episode. "I'm their father — if I don't lie for them, who will?" Loughlin's character feels uneasy by the whole thing and ends up coming forward to school administrators about their plan.